A thread dedicated to discussions on Orlando and Central Florida trails and bicycle infrastructure. 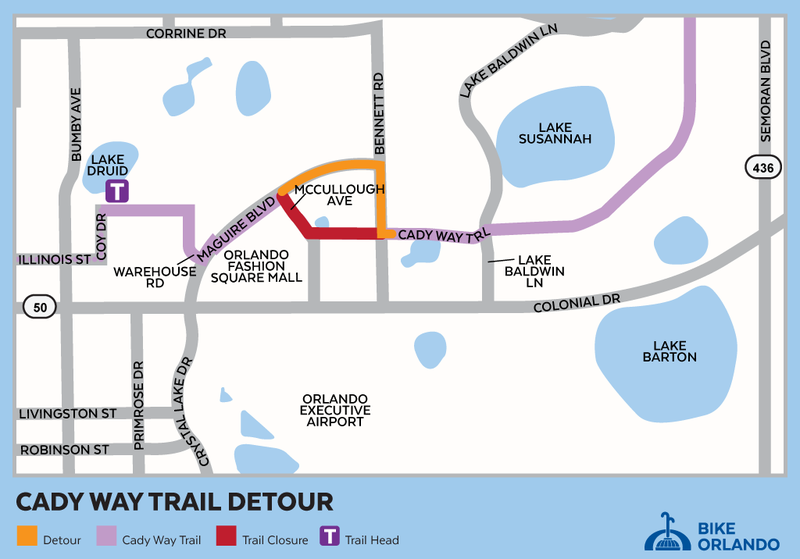 The Cady Way Trail stops at the entrance to Lake Druid Park as it approaches Downtown. 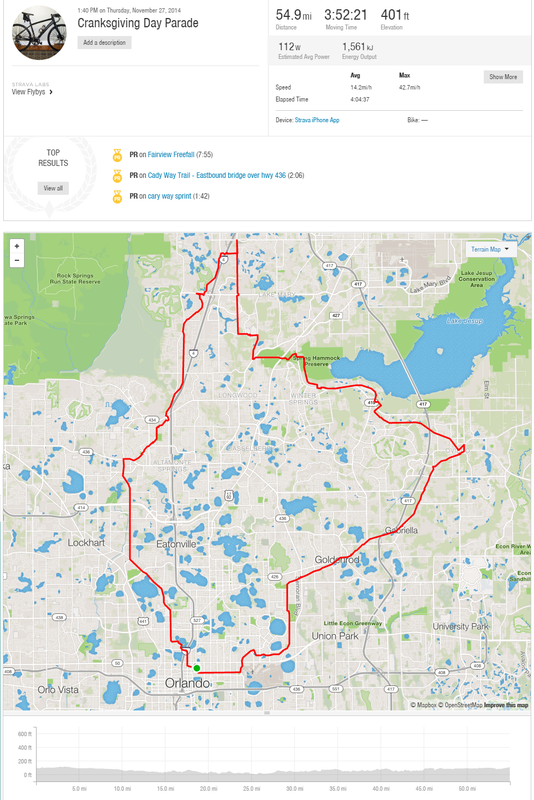 If it was just extended to the cul-de-sac of Laura Pl, then it would connect to the Bumby Trail by a small local road, which is a perfect compromise instead of an actual trail. Trail on the right and Laura Pl on the left. I believe that location at the entrance to Lake Druid Park is where the on-street route to the Orlando Urban Trail begins. There are signs that guide riders through Colonialtown North over to the OUT near Lake Highland Prep, where you can either go north to Mead Gardens or south to downtown. The new Bumby connector is a great way for cyclists and pedestrians to get to Audubon Park. It's crazy that this whole thing could be built for less than the cost of most of the unnecessary highway projects in Orlando. The 408 extension is completely unnecessary. the 417 north and south extensions are also completely unnecessary. I'm not sure if you mean East end or West end, but I strongly disagree with them not being necessary. ESPECIALLY the East end. It's a nightmare to go East of the current end of the 408. An absolute traffic nightmare. I was specifically referring to west. My main concern with the east extension is that it will spawn new sprawl. Orlando really needs to start limiting the mega-developments along its outskirts. I liked the option with a widened Colonial and elevated 408 toll lanes running in the middle in a similar setup to what is being done to I-4. That was one proposal brought up but unfortunately fell through. Seemed like the least invasive option, all other options require carving out new ROW through environmentally sensitive areas. I support the 408 extension eastward, it is much needed but I am really hoping it doesn't translate to more leapfrogging, traffic-choked sprawl east of the Econ River. I'm not aware of such a plan for a westward extension... do they want to extend it to US 27? I don't see how it could be extended fairly easily. I imagine it would have to share ROW with the 429 and possibly the Turnpike and then possibly run along Stoneybrook/Marsh Road to US 27. Either way I don't see this extension as necessary as the eastern one. Are you talking of taking the 408 to the coast? I don't see the Mormons giving up more land than they absolutely have to, and probably to aquire more land so that the drive to the coast would be a real "Greenway". The more options to tie the space coast, the better I think. I remember seeing a map with a 408 west extension not too long ago. It didn't go too far, but it would have the same problem I have with the west extension. The only redeeming quality about the west extension is that it is the only new highway that Orlando should need for a long while. Colonial is a nightmare over there. The main chunk of Deseret Ranch (AKA "The Mormons") is along the 528. The name on the OCPA site is "Farmland Reserve Inc" and it looks like they do own 2 parcels up on 50 where this Eastern part of the project would run, but those parcels are nothing like the 528 parcels. They also own some huge parcels along 520 but those aren't involved in the expansion as it is currently proposed. The 2 parcels on 50 aren't even in the current proposal, because that stops at 520. Getting it all the way to I-95 would be ideal, though. 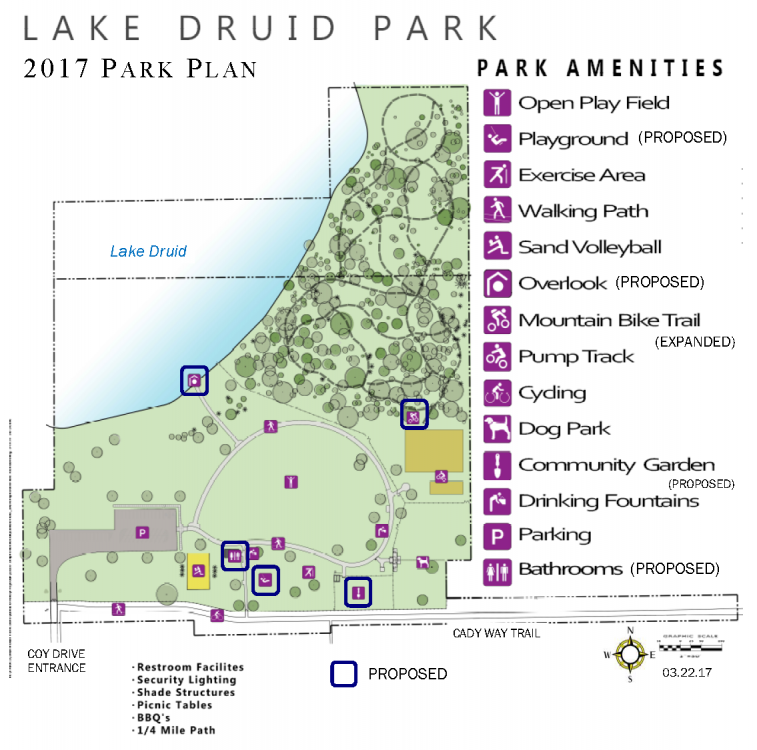 The new plans call for "Construction of playground, tot lot, shade shelters, rest rooms, and lake overlook; expansion of bike single track. Grading and completion of 10-ft. wide bike path." The 10 ft wide bike path will be for connection of the parking lot and the CadyWay trail extension to the park amenities such as the new restrooms (much needed and hopefully includes a bike wash station), community Garden, Dog Park, Pavilions, Pump Track, and Lake Overlook. My favorite part: the singletrack planned expansion to the north of the current limits of the site. Currently, the single track is a rather tame approximately 1 mile loop, with a chainlink fence separating it from the rest of the wooded area to the north. The new land should allow for probably at least a mile more of singletrack trail to be built on the new land, which was planned as being slightly more advanced sections. I helped build this park in the early stages, and am stoked to add more trail! The current loop is pretty short and gets old quick, so more advanced trail in the back would make it much more fun to go spend more time here for advanced riders and allow the kids to progress to a higher level. Add in some shaded areas and restrooms for extended stays and picnic options, recreational and exercise activities that they added and this park is really shaping up! Great news, and hope to see this get built soon. . . It will eventually connect WOT with Seminole Wekiva Trail. 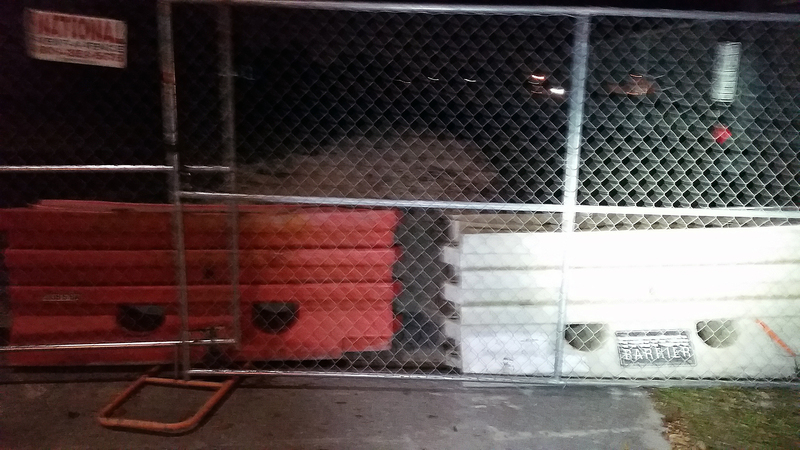 The portion of the Cady Way trail by the mall west of Bennett is CLOSED! I found this out rudely last night with a chain link fence across the entrance and the trail ripped up. Anybody know what is going on there? is this part of the construction projects east of the mall? That sounds like something Bungalower should look into. I'd send them an email because they do small research pieces every now and then. There should at least be signs letting people know about the closure and provide detour routes. If cars were involved, this would have been done without question. I ran over there this weekend and there were a few cyclists trying to use that portion of the trail when I was in the vicinity. Per FDOT standards, that's supposed to happen. The City should get into some trouble for that. No signage whatsoever, no detour markings, no alternate route provided. Just a big honkin' fence across the trail and some temporary jersey barriers. Should have been done better and should have had alternate routes planned. I know they have to have MOT for car traffic, why not for bike and pedestrian traffic? We do. FDOT has been really critical of pedestrian MOT especially in the last year. FDOT doesn't like being called the most dangerous state for peds and bikes multiple years in a row. Someone from the City dropped the ball. Orlando Sentinel Story on the "Coast 2 Coast Connector" trail. They have a meeting in Brevard County about how to tie it in to Cape Canaveral and the Atlantic Ocean, but it seems like it won't be a dedicated route, but a signed street route. I hope they can at least put a bike lane there! The Cady Way Trail will be temporary closed from the Fashion Square Mall Trailhead to Bennett Road due to the construction of an apartment complex. The new apartment complex is required to replace and extend the trail from Bennet Road to McCullough Avenue and replace the existing park amenities. This closure will last for approximately twelve months. We are asking that users of the trail to park at the Lake Druid Park Trailhead located at 899 Coy Drive. The apartment complex developer has ordered the detour signage and it should be installed within a week. If you have any additional questions please give me a call. Basically city is trying to connect all the trails around CBD. IT will go from Lake Underhille, along Anderson to Rosalind. Finally! The bike trail in Como has no connection to any other trail. This is great news. Plans have shown for a while connecting DT - Gertrudes walk with the OUT, Lake Underhill Trail and Shingle Creek trails. If they are on the books now, soon we will have a solid backbone network going from downtown and Public transit (sunrail, buses, etc) to outlying neighborhoods in all directions. Hopefully next up are the Greenway Gap, Azalea Park, and Pine Hills trails!